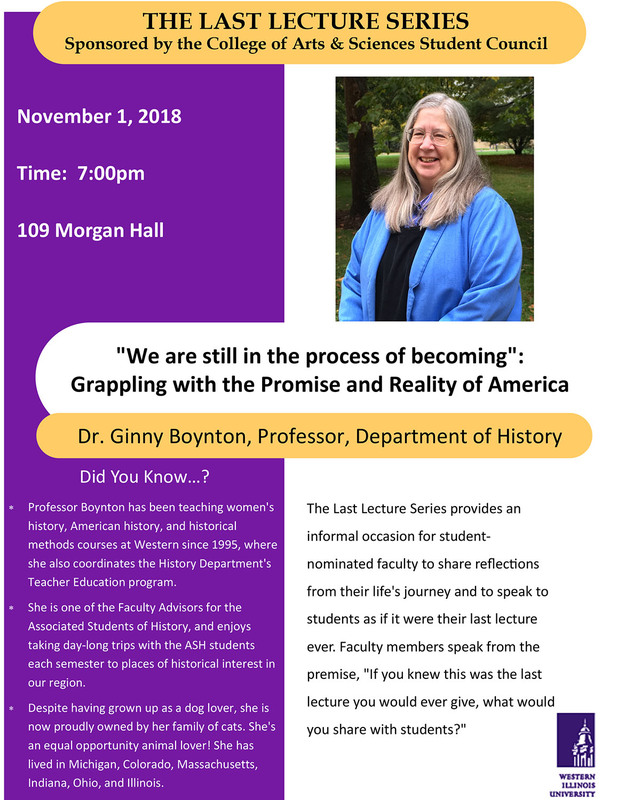 MACOMB IL – The Western Illinois University College of Arts and Sciences Student Council will present a "Last Lecture" by History Professor Ginny Boynton at 7 p.m. Thursday, Nov. 1 in Morgan Hall, 109. In her lecture, "'We Are Still in the Process of Becoming': Grappling with the Promise and Reality of America," Boynton will talk about her life and speak to students as if it was the final lecture she was going to deliver. Boynton has been teaching women's history, American history and historical methods courses at WIU since 1995. She also coordinates the history department's teacher education program. Boynton is one of the faculty advisors for the Associated Students of History, and enjoys taking day-trips with ASH students each semester to places of historical interest in the region. "I look forward to reflecting on how Americans have at times made effective use of the nation's founding principles to push the government to more fully embody ideals such as equality, liberty and the sovereignty of the people, and how even when the nation has failed to live up to those founding principles, they have remained a source of inspiration for many Americans to continue that struggle," said Boynton. The concept of a "Last Lecture" became nationally recognized in 2007, with Randy Pausch, who gave his "The Last Lecture" speech on Sep. 18, 2007 at Carnegie Mellon University. Pausch's best-selling book by the same name was chosen as WIU's First Year Experience reading selection for 2010-2011. Since Pausch's presentation, the "Last Lecture" concept has been popularized and offered on college campuses throughout the U.S.
For more information, visit wiu.edu/cas/lastlecture.php.